The brief descriptions below are designed to familiarize you with our dentist's training, professional credentials and work experience. Dr. Jae Shim graduated from University of Illinois at Chicago with BFA in Fine Arts, studying Studio Arts with Sculpture as a second major. He then started to work as a dental laboratory technician and eventually became the owner of a high tech dental laboratory in downtown Chicago, until he went on to pursue a doctorate degree in dentistry. He believes a person with artistic sensitivity, extensive dental lab experience that combined with clinical expertise would be in the most ideal position for the patients' optimal dental care. 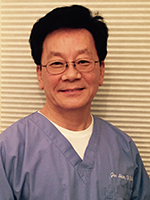 Dr. Shim earned his DDS degree from University of Illinois College of Dentistry in 1998, and has been in private practice since then. Dr. Shim focuses on providing the optimal treatment that his patients desire. He attends numerous continuing education courses to up to date with the latest advancements in Dentistry. He is a member of the American Dental Association, Chicago Dental Society, Advanced Dental Implant Institute, and Academy of GP Orthodontics. He loves to take time to listen to his patient's dental concerns, and provides latest available options of treatment for each specific situation. He believes such an open and caring communication is key to build a trusting relationship with his patients. When not treating his patients or sharing time with his wife who is a professional artist, he enjoys diverse reading, playing piano, and work out.